You’re about to learn some vocabulary to talk about mathematics in English. Also check out Numbers in English: The Ultimate Guide. As an excellent speaker of English, you can talk about almost anything you want. Don’t worry! You’re not alone! Loads of high-level learners have problems with even the simplest maths vocabulary in English. So today, let’s solve this issue once and for all! But what are the answers? This works for all the sums we’re looking at today. OK, so you can make a simple sum in English. But I’m guessing that most of the time, when you need to talk about maths in English, things aren’t that simple. Most of the time, when people are talking about numbers and manipulating them with mathematics, they don’t just do a simple sum, then stop. I mean, how weird does this look? Usually, we need to do a series of small sums. So we take a number we already have, then do the calculation from there. In other words, maths, like language, is something we only use in context. You’ll get the answer by adding 13 to 23. OK — I’ve added the numbers up. Now what? OK. Once all the numbers are added together, send the result to me. Or however you calculate company taxes. I don’t know — I’m an English teacher. With some basic math terms in English, we have a slightly informal way and a slightly more formal way of saying them. Find the answer by subtracting 10. Add up the numbers and take away seven. Get the total by multiplying that by 100. Division has always driven me crazy. I mean, addition, subtraction and multiplication — they’re all fine. You can combine any two numbers and then you get another whole number. But with division, you can get some ridiculous results. Results that make my head hurt. Again, there’s really just one way to talk about division. And that’s it. OK. So you can talk about basic math terms in English. But what about talking about a more complicated series of sums? Like we do in real life. I’m guessing this is something that you either have to talk about or that you have to understand at some point in your English-speaking life, right? Start with four multiplied by our yearly profit in euros. Take that and divide by 32, then subtract the number of sales in March. OK, then take all of that and take away the number you started with. 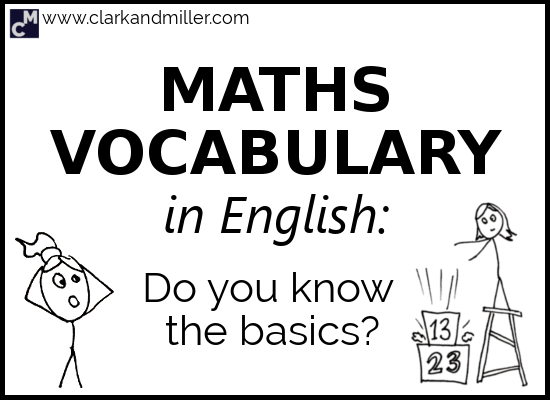 OK. Now you can use maths vocabulary in English. Can you describe this sum to me? Answer in the comments … if you dare! Hi Gabriel I really liked this subject you explained. It’s been quite useful. Thanks a lot for this post. Here is my answer to your question: Take 67 divided by18 and add that to 32. Then, take from that and finally multiply the result by 9… Is it OK? Great work, but just one little bit was a little unclear. You said “take from that and finally multiply the result…” — I guess you wanted to say “take 87 from that,” right? If the answer to that question is “yes,” then — great work! You got it! The important thing is that you’re using the vocabulary correctly and in a way that makes everything super clear. Nice one!